Many speakers are mounted on a sphere like rig in this cool looking 3d design. The metal look of the speakers goes well with dark music styles. A cool video loop. A striking effect, adding this video loop to your visual set, a beautiful piece of footage for your library. 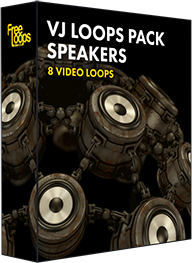 This video loop is part of VJ Loops Pack Speakers.